This is the fourth volume in what is turning out to be a real winner for the Guild labels' Light Music Series. The seventy odd minute collection contains a wide spectrum of works with the leading exponents of the genre such as George Melachrino, Sidney Torch, Robert Farnon and Charles Williams alongside many others. There are many popular favourites here including a delightful 'Television March' by Eric Coates, the wonderful Kashmiri Song with Mantovani and a raucous medley from the musical, 'Oklahoma'. Other interesting names included Robert Farnon who conducts Cochrane's 'Honey Child' with suitable panache throughout. I already possess Schertzinger's 'Sand in My Shoes' with Farnon from an earlier album on Dutton but this Guild version is slightly more translucent. 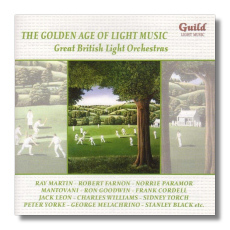 Further interesting items include 'Valencia' by Edmundo Ros and his orchestra, a lovely and evocative 'Spring Morning' by George Melachrino and a rousing 'Television March' by Eric Coates. The disc concludes with a wonderful medley from 'Oklahoma', surely the right tonic to what is really a wonderful disc. Guild's remastering is really excellent with just the right balance between reducing the surface noise and retaining truthful sonics of these recordings. I just can't wait for more releases in this series!